Silver Lake landed on the L.A. Time’s Crime Alert after 26 property crimes were reported during the week of Dec. 2 – Dec. 8. In comparison, during the previous three months, Silver Lake averaged 13.5 crimes property crime, which includes burglary, theft and arson, a week, according to L.A. Now. Most of the crimes were related to vehicle theft and break-ins, with small clusters reported northwest of the Silver Lake reservoirs as well as an area south of Sunset Boulevard and west of Coronado Street, according to CrimeMapping.com. 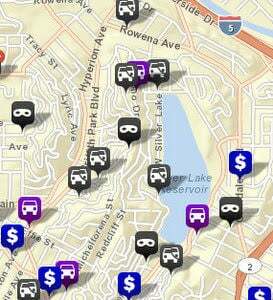 In addition, CrimeMapping.com also shows a trio of thefts taking place along Sunset Boulevard.